There is so much to see and do here in Maggie Valley NC, that you just might have trouble deciding what to do in the time you’re here! But don’t fret! We’re here to help. We’ve hand selected the top 15 things to do in Maggie Valley. Each of these is an absolute must see when visiting Maggie Valley NC! Visit Maggie Valley’s world famous attraction, Wheels Through Time Museum, located at 62 Vintage Ln, Maggie Valley, NC. Wheels Though Time Museum contains the “world’s premier collection of rare American motorcycles, memorabilia, and a distinct array of unique “one-off” American automobiles”. All of these are displayed in life like scenes with lots of historical information on each other items. There are more than 350 rare machines to see. Take your time browsing this wonderful indoor attraction, as there is so much see. You’re also likely to see Curator and owner, Dale Walksler walking around and answering questions. He’ll even start the various bikes up sometimes for visitors! Located just 5 miles off the Blue Ridge Parkway in Maggie Valley, North Carolina our museum houses a collection of over 350 rare machines. Soco Falls is a real hidden gem, that many visitors miss out on seeing. 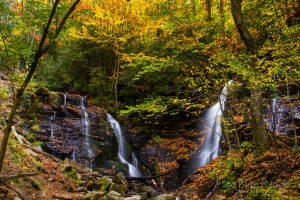 Soco Falls is located just a little ways past the Blue Ridge Parkway on Highway 19, heading towards Cherokee. Soco Falls is actually two waterfalls, one about 50′ and the other over 100′. Both falls cascade next to each other into a creek below. Soco Falls is gorgeous year round, but especially in the Fall! >> Read more on Soco Falls and get detailed directions. One of the beautiful sunsets on the Parkway is visible just a little ways up the Parkway, from the Maggie Valley entry point, at Waterrock Knob. The Waterrock Knob parking area is absolutely stunning, providing very wide and long distance views looking both east and west. This makes it perfect for both a sunrises and sunsets, assuming the fog doesn’t move in. The parking area has a nice meadow in the center, perfect for a picnic or to let the kids play in. The Parking area is also surrounded by nice concrete Picnic tables, and you can even hike up to the top. >> Learn more about Waterrock Knob, see photos, and get directions in our Waterrock Knob Guide. Recently opened, Elevated Mountain Distilling Company is the first legal distillery in Haywood County (please note we said legal … haha). Haywood county has been known for exceptional distilled products over the years, the most famous of whom is Popcorn Sutton, a famous moonshiner. Elevated Mountain Distilling Company continues with this tradition of providing the finest spirits, made from local corn and water. Stop by, sample some of their products, tour the distillery, buy some memorabilia, and of course some “unaged whiskey” and other products, such as Raymond Fairchild Root Beer White Lightning. Can you solve the puzzle with your team mates and escape? Welcome to the ever popular world of Escape Rooms with one of Maggie Valley’s newest attractions, Maggie Valley Puzzle Rooms. Rooms are physical adventures, where you are placed, along with a team into a room. You must, as a team, find clues, solve puzzles, keys, combination locks, and whatever else necessary to get out within one hour! Sound easy? It’s not, but it sure is fun! Puzzle rooms are designed for groups of two to 10 people, ages 7-85. Each room has a different scenario with its own plot, and new scenarios and plots are added frequently. They also have a new room designed for children ages 4-8. The Blue Ridge Parkway, one of the most popular national parks and scenic drives in the world, is just minutes from Maggie Valley Town Center. Even better? The section of the Parkway, from Maggie Valley, NC to Asheville, NC is one of the most beautiful, due to the high elevation and long distance scenic views. The Parkway has a Maggie Valley entry point, just a few miles south on Highway 19, traveling towards Cherokee. Get on the Parkway, and head east to Asheville for miles an miles of scenic views. You can also head to Cherokee and the entrance of the Great Smoky Mountains National Park, at the Oconoluftee Visitors Center. Be sure and stop off at Waterrock Knob, Highest point on the Parkway, Devil’s Courthouse, Graveyard Fields, and the Pisgah Inn. >> For more information on the Blue Ridge Parkway, see our Blue Ridge Parkway Guide, which covers the entire parkway from Cherokee to Virginia. This guide is full of photos, important locations, information and more. One of the best and most beautiful hikes you can take in the Maggie Valley NC area is up to Purchase Knob, a 5,000 foot mountain top bald (meaning mainly grass, no trees). Purchase Knob provides 360 degree views of the surrounding Blue Ridge and Smoky Mountains. You’ll look out into the Great Smoky Mountains National Park in one direction, and out of the Plot Balsams and Cold Mountain on the other. While there, you can visit Ferguson Cabin, the highest cabin in the National Park. You can also visit the Science Center, where scientists work and do research. You can catch the Hemphill Bald Trail, and the Cataloochee Divide Trail from here as well. Hemphill Bald provides some amazing scenery, and will take you by The Swag, a famous luxury mountain top Inn. >> Learn more about the hike up to Purchase Knob, including directions, photos and details on distance and difficult in our Purchase Knob Trail guide. No trip to the mountains is complete, without a stop at one of the local gift shops, and Maggie Mountaineer Crafts is one of the oldest and the most popular. The shop is full of unique mountain memorabilia, “Maggie Valley wear”, Native American items, knives, toys, stuffed animals, coffee mugs, and much more. Top off your visit by tasting some of their famous fudge, and bring some home. Made fresh daily, this the some of the best fudge you’ll eat anywhere. They have 35+ flavors!! Be sure and get your photo taken by the Moonshine still, big’ol Black Bear, the Hillbilly pickup truck, or even in the outhouse! Head out back to enjoy the gardens and the crisp and cool Jonathan Creek that runs right behind the store. >> You and your family will have a blast at Maggie Mountaineer Crafts. Read our full guide on Maggie Mountaineer Crafts for more information and photos. Interested in taking a remote, peaceful and scenic drive that most visitors don’t even know exists?? Heintooga Round Bottom Road is for you. This 28 mile gravel road that goes from the Parkway, near Maggie Valley, down to Cherokee. For most of the drive, the road is one way, so you don’t have to worry about oncoming traffic. While there aren’t any major scenic attractions, the road is full of small waterfalls, wildflowers, and wildlife, if you’re lucky. Towards the bottom, you’ll ride along a gorgeous creek for miles that is full of photo opportunities. >> Learn more about Heintooga Round Bottom Road, including photos, directions to get there, how to get back, and information on the type of vehicle we recommend you use when driving it. Frankie’s Italian Trattoria in Maggie Valley serves up some of the best Italian food you’ll find anywhere, and is a favorite with locals. Featuring dishes such as their handmade Lasagna, Veal Marsala, Penne with in house made Vodka sauce, Chicken Romano, and Chicken Scarpariello (with in house and handmade sausage!). Served with a glass of one of their amazing fine wines, it’s a meal that will make you come back for me. Not only is the food incredible, but so is the atmosphere and service! They even have frequent specials. Frankie’s also serves hand tossed and made to order Pizza, that is outstanding, and brought to your table fresh and hot. Finish up with a made to order Cannoli, or an in-house Ricotta Cheesecake, or one of the many other deserts. You really can’t go wrong. Frankie’s is open Monday – Saturday 11:30 – 9 or 10pm, depending on the season. Call ahead for hours, and for reservations, it’s a really popular place. The drive into the remote Cataloochee Valley, in the Great Smoky Mountains National Park, will slowly take you back in time. You’re cell service will end, your pace will slow down, and you’ll imagine yourself traveling down the old dirt road in a horse or mule pulled wagon, watching our for Indians, much as early settlers to this area did as they travelled. Cataloochee Valley was a large settlement that become part of the Park when it was formed in the 30s. Cataloochee Valley features: old homes, barns, and old school, and church. There are hiking trails and creeks to explore. Cataloochee Valley is also full of wildlife including bears and Elk! 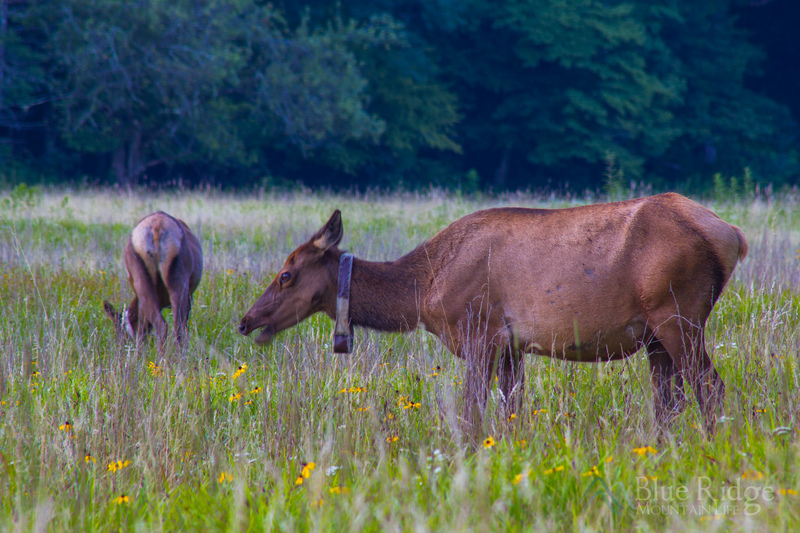 People come from all over the world to visit Cataloochee Valley and to see the Elk, which are out most often in the early mornings and late afternoons. Cataloochee Valley is a place you’ll want to visit, not only to see the Elk, but to experience it as well. The Valley is beautiful. >> See our Cataloochee Valley Guide for more information, photos, hiking trail information, and detailed directions. Country Vittles has been in the Valley for a long time, and is a tradition many returning visitors, and a goto place of many resident. Country Vittles is the only “All you can Eat” breakfast and lunch restaurant in Maggie Valley. You can be sure of two things here: You’ll get a great country style breakfast, and you won’t leave hungry. Food is brought to your table “family style”, and your waiter or waitress will keep bring you new bowls as long as you want them. Breakfast includes: fried hash browns, bacon, sausage, scrambled eggs, grits, biscuits and gravy, sliced tomatoes, and fried apples. If you’re visiting in the winter, Cataloochee Ski Area should be high on your list of things to do and see. Located way up Fie Top Mountain Road, behind Maggie Valley is one of just a few Snow Skiing resorts in North Carolina, Cataloochee Ski Area. Cataloochee Ski Resort has more than 50 acres of trails for every skill level, and specific areas for snow boarders. They offer gear rental, along with ski and snow boarding lessons. Elevation is 5,400 feet and the slopes provide a 740′ foot vertical drop. Not put to Skiing, stop by Tube world at the base of Fie Top Road in Maggie Valley, and tube down the slopes, and back up using their carpet lift. Fun for the whole family! Cataloochee Valley Ranch has been in Maggie Valley for more than 75 years. The Ranch offers horseback riding, fishing, hiking trails, wagon rides, cabins, an Inn with a pool, and a restaurant. Cataloochee Ranch is high above Maggie Valley, and provides gorgeous and peaceful scenery that provides stunning views. If you decide not to stay at the ranch, it’s still a pleasure to visit and have lunch or dinner outside behind the Inn. The lunch and dinner menu varies, and you if what is being served is important to you, call ahead. But dinner could be a Gourmet Prime rib dinner with all the fixings to a simple burger and hotdog cookout. Regardless, it’s delicious. Take time to explore the old inn, and the surrounding grounds. Even better, schedule a horseback ride, then stay after for lunch or dinner. Mountain Music and dancing has been a tradition at Stomping Grounds in Maggie Valley for as far back as most people can remember. Shows are done on the huge 60 x 80 foot polished dance floor, each Friday and Saturday night, April through October. The minute Ivy Hill band begins to play, the dancing starts, and doesn’t stop until the show is over. Dancing styles include square dancing, line dancing, clogging and two steppin’. Dancers are dressed up beautiful matching dance outfits, and put on a heck of show. This is a show you don’t want to miss, and will take you back in time, in place where these styles of dance were invented.